Hundreds of families took advantage of the annual “Commerce to College Fair” held last Saturday in hopes of getting an early start on the college search and application process. The event was sponsored by the City of Commerce Public Library and the city’s education committee, and included several bilingual workshops aimed at helping middle and high school students and their families explore the steps needed to gain college admission, including required academic courses, testing and the application process. Fifteen-year-old April Alvarez told EGP the fair was “eye opening.” The Schurr High School sophomore is considering a career as a registered nurse and said she really appreciated the encouraging environment. “People are there, telling you how important education is, about working hard and striving for something,” she said. Alvarez’s mother, Sally Rivas, a life-long Commerce resident, said the event is a great way to help students prepare for college and a career. “No matter what we [as parents] say, its great to have someone else reiterate it,” Rivas told EGP. She was glad to see some of the top-tier 4-year universities represented, but noted that there was something for everyone, even information on trade tech and community colleges. Wiley Canjura is a senior at Schurr High in Montebello. She described the event as fun, and said many of her friends were also in attendance. The 16-year-old wants to be a high school teacher or pediatrician, and while there were not a lot of colleges with Child Development majors present, she said she learned about other great programs and careers. 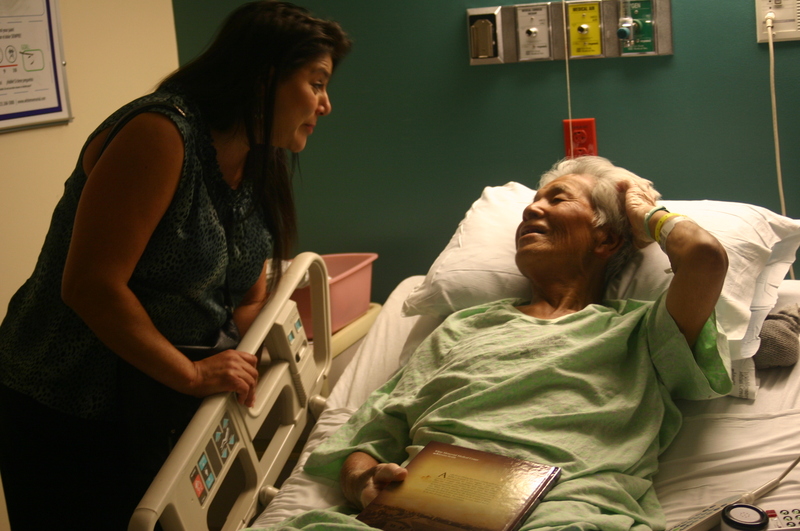 “It’s good to know your options,” she told EGP. Following the fair, attendees and city representatives gathered at the Veteran’s Park baseball field for a closing ceremony and gift raffles. Mayor Joe Aguilar reminded those in attendance that the City of Commerce offers free homework assistance, even at the college level. “Why is your college education so important to us? Because you are important to us,” he said. Robert Cornejo, principal of Rosewood Park Elementary, threw out the first pitch during the ceremony and took a moment to reminisce about his youth growing up in Commerce. “Back in the day, there was no Starbucks, no casino… and definitely no scholarships,” he said, referring to the Commerce scholarship program that awards thousands of dollars each year to dozens of the city’s young residents. 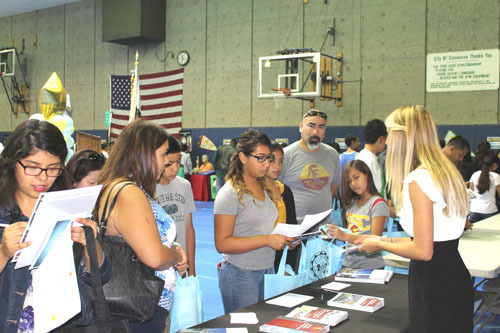 Councilmember Tina Baca Del Rio told EGP she estimates about 500 people attended the college fair, but there could have been more since people came and went at their leisure. She said people from other cities also attend, since the college fair was open to the public and not just for city residents. Gov. Jerry Brown signed legislation in downtown Los Angeles Wednesday that will raise the minimum wage in California from $8 an hour to $10 by 2016. Brown was joined by the bill’s author, Assemblyman Luis Alejo (D-Salinas) and Assembly Speaker John Pérez, (D-Los Angeles) and other supporters at the bill signing ceremony held at the Ronald Reagan State Building on Spring Street. He then headed to Oakland for a second ceremony. Under AB10, the state’s minimum wage will rise to $9 an hour on July 1, 2014, and then increase to $10 an hour on Jan. 1, 2016. It is the first adjustment in six years. During that time, low-wage workers in California have seen their earnings decline, according to Alejo. “With over 60% of our minimum wage workers 26-years-old or older, we have created a system where we pay workers less but need them to spend more,” says Alejo in a statement posted on his website. Between 2006 and 2012, the inflation-adjusted earnings of California’s bottom fifth of wages earners declined nearly six percent, according to a recent report by the nonprofit, nonpartisan California Budget Project. The report further states that the buying power of minimum-wage earners has steadily eroded over the past four decades. The bill was opposed by some business leaders who said the increase would make it more difficult for companies to operate in the state, possibly damaging the California economy. Opponents said businesses would be forced to raise prices or hire fewer workers to offset the costs of the higher salaries. Brown was unequivocal about his support for the bill when it was approved by the Legislature. The new law will have a high impact on California, which is reported to have the nation’s largest number of the so-called working poor. “Our workers are among the most productive in the world, and with the signing of the minimum wage increase, working people will see significant relief and help California’s economy continue to outshine the rest of the nation,” Pérez said. Dozens of organizations in California alone will come together for 12 separate protests across the state in support of immigration reform. According to the Coalition for Humane Immigrant Rights Los Angeles (CHIRLA), a variety of events—from rallies to marches, to community forums, vigils, walks and a rock concert—are being planned for Bakersfield, Fresno, Irvine, Modesto, Monterrey, Sacramento, San Bernardino, San Francisco, San Jose, San Diego, Santa Barbara, as well as Los Angeles, where a “March of the Stars” and rally will take place at 10 a.m. that day. Organizers will forgo their usual route in downtown Los Angeles and MacArthur Park, opting instead to gather at Hollywood Boulevard and Western. 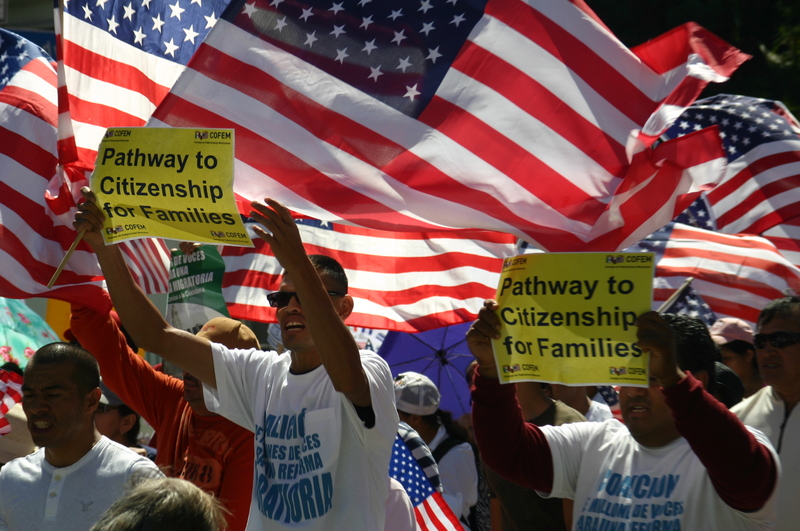 Their goal is to compel congress to pass immigration reform with a path to citizenship by the end of this year. “…If the House of Representatives’ Speaker Boehner allowed a vote today, there would be sufficient votes from Democrats and Republicans to approve a proposal that would secure our borders, boost our economy, and keep families together,” according to CHIRLA’s press release announcing the march and rally. The series of protests are being organized by “The California Table,” a project of CHIRLA and a network of more than 45 independent organizations in California working for immigration reform, according to the statement. Several metered parking spaces were temporarily turned into a comfortable waiting area where constituents, many of them local business owners, waited for their chance to speak with the mayor as vehicles zoomed past the spot in front of La Serenata de Garibaldi. Aurora Rodriguez, owner of La Serenata, told EGP she was very happy the mayor set up camp in front of her door. Cleaner streets, less graffiti and vagrants, were among Rodriguez’s concerns. While La Serenata has its own parking lot, street parking is an issue, she said. Other business owners and local residents echoed the same concerns when it was their turn to speak with Garcetti. In response, the mayor advised the business owners to consider forming a Business Improvement District (BID) to help improve the appearance of the commercial corridor. He told them about his idea to pick about 20 “main streets,” in different neighborhoods throughout the city, and invest in their curb appeal. “This feels very similar to Echo Park when I was there about 10 years ago. You know Echo Park had a lot of family-owned businesses for a really long time, and some vacant store fronts,” Garcetti said, explaining a targeted neighborhood initiative helped property owners improve their storefront facades, along with other changes that improved the “street-level experience,” which in turn brought more people out, and attracted more people from outside the area. “Why would anyone want to stop here? There’s nothing,” said one business owner who wants to improve his businesses but said he doesn’t know where to start. Garcetti said there is a lot of culture in the area and he believes making the area a destination requires a more vibrant nightlife. Christina Ramos, of Printing Services on E. First Street, asked Garcetti in Spanish to help promote the mariachis at Mariachi Plaza. Garcetti said tourists who arrive at LAX don’t know about Mariachi Plaza, which he called an “integral part of the city.” He wants to see how the City of Los Angeles Department of Cultural Affairs can help promote and attract tourists to the area. “Usually it becomes an issue of race, ‘the white folks are coming,’ but we can’t get hung up on that,” Uribe said, explaining the so-called “enemy” that poses a threat to the community are corporations not individuals. Garcetti also touched upon gentrification with resident Guillermina Cueva. Garcetti said he knows the main concern is keeping Boyle Heights affordable to the current residents. “We need to build more units of affordable housing to keep the affordability here. In Echo Park and Silver Lake, we built a lot of units for low-income and working people,” Garcetti said. Cueva also expressed her concern over gang activities in a specific location, graffiti and other quality of life issues. Garcetti reminded her to dial 3-1-1 for graffiti, bulky item pick up and pot holes. He said he would talk to the Hollenbeck Police captain about increased patrolling. The mayor also spoke with high school students about scholarships and helping them with transportation for field trips. Blanca Dueñas, a local mother and activist, asked the mayor to repair a sidewalk at the intersection of Boyle and Pennsylvania, and urged him to do what he can to ensure that Prop 30 funding goes to its intended purpose: education. He also talked to another group about the possibility of the city’s Department of Aging offering adult education. Garcetti shook a lot of hands and kissed many women on their cheeks, as would seem culturally appropriate in the predominately Latino neighborhood. He also posed for photos throughout the event. “This is great, this is Boyle Heights where my family came from. This is a street we transformed into a park and I figured, why not take advantage of this day, Park LA, and actually meet with constituents,” he told reporters. 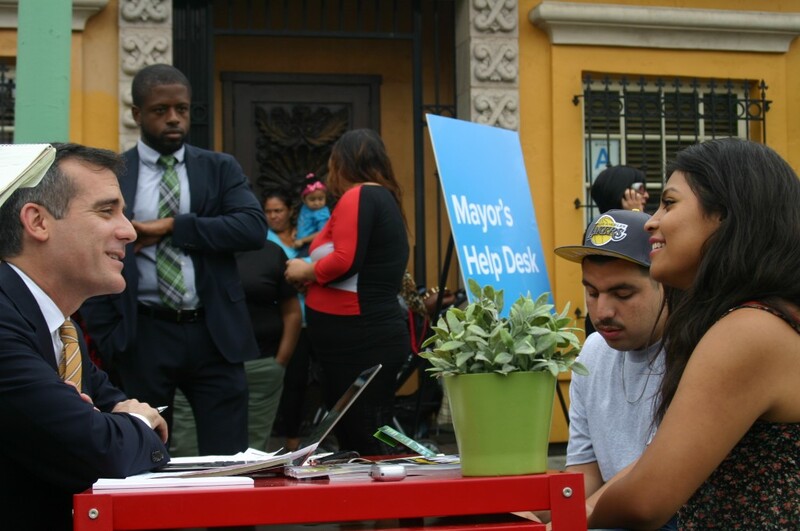 Garcetti said most people can explain their problem in one minute and his staff can start working immediately to resolve the problem, and to connect people. With less than two months until the November 5 General Election, candidates in three local races are busy fundraising, phone banking and rallying volunteers to help spread the word that they have what it takes to make a good member of the city council in Bell Gardens or Montebello, or on the Montebello Unified School District School Board of Education. In all three elections, challengers are pushing to take seats from incumbents, some of whom have been in office for more than a decade. All of the positions are part time. Here’s a brief look at the list of candidates. In the southeast city of Bell Gardens, where there are no council districts and council members are elected at large, three seats are up for grabs. The incumbents, Mayor Daniel Crespo, Mayor Pro Tem Priscilla Flores and Councilman Sergio Infanzon are facing challenges from three candidates; teacher and former planning commissioner Jose Mendoza; Business owner Jazmina Saavedra and Yvette Silva, a pharmacy manager. The three candidates with the highest number of votes will be elected. As in Bell Gardens, Montebello council members are also elected at large. The seats of two incumbents, Mayor Pro Tem William M. Molinari and Councilman Art Barajas are on the ballot, along with the seat of Councilman Frank Gomez, who decided not to seek reelection. The five challengers vying for seats are retired financial technician and long time community activist Anna Arriola; operations manager Emma Delgado; teacher and school administrator Flavio Gallarzo; Montebello city clerk and quality control supervisor Daniel Hernandez and Vivian Romero, businesswoman and chairperson of the Montebello Culture & Recreation Commission. The Montebello candidates will face off in a forum at 7 p.m. today, hosted by the Armenian National Committee’s San Gabriel chapter at the Armenian Center located at 420 Washington Blvd. During the forum, candidates are expected to answer questions about the city’s economic state, the Montebello Hills project and the overall state of the city before they take questions from residents. This is potentially one of the most interesting races, with several challengers hoping to unseat the incumbents, including two who were appointed to their seats and are seeking election for the first time. While four seats in all are on the ballot, voters will be asked to select from two separate ballot questions: choosing three as part of the regularly scheduled election cycle, and the fourth as part of special election to fill the two years remaining on the seat left vacant by the death of Board Member Marcella Calderon in 2012. Paul Montoya was appointed to replace Calderon, but must win election to stay in the seat. Another appointee, Benjamin Cardenas is also attempting to win his first election to the board. He was appointed by the MUSD board in Dec. 2012 to replace Ed Chau, who was elected to the State Assembly. Long-time MUSD board member and current president, Hector Chacon, and vice president Gerri Guzman are also seeking another four-year term. Challenging the current office holders —Chacon, Guzman, Cardenas — in the regular election are: community educator and historian Lani Cupchoy; retired electrician Frank Thomas Morales and Sonia Saucillo-Valencia, who lists her occupation as domestic engineer. In MUSD’s Special Election, the challengers to Paul Montoya are: Edgar Cisneros, a deputy staff person to Supervisor Gloria Molina and physicist/ manager/ recruiter, C.J. Salgado. Yvette Silva – Pharmacy Manager: Did not submit a statement by EGP’s deadline. The California Department of Toxic Substance Control (DTSC) will meet Friday in Boyle Heights with a group of residents, elected officials and community members who have been very vocal about their outrage over toxic emissions from the Exide plant in Vernon that have increased the local cancer risk and the possibility of neurological deficits in children. People living in the nearby communities of Boyle Heights, Maywood and Huntington Park have called for the plant to be permanently shuttered. 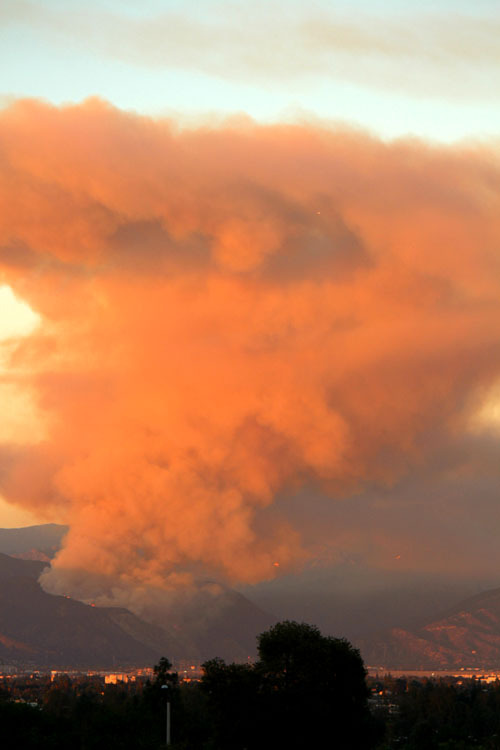 Some of the most vocal stakeholders have been invited to attend Friday’s session, according to DTSC’s Public Participation Specialist Stacey Laer. She said the meeting would be a “casual” conversation with participants “from all walks of life,” including elected officials, environmental activists and residents. “We want to continue the dialogue and we plan on hosting future invitations for the surrounding communities,” said Laer. The informal session will help DTSC filter out what information residents still need to understand what’s happening at Exide and what the agency is doing. It will also give the agency an opportunity to plug information gaps for the general public, Laer told EGP. Stakeholders are expected to also discuss the free blood test that will be available to thousands of residents from an area that includes Boyle Heights, Maywood, Huntington Park and Vernon. Although this session will not be open to the public, DTSC does plan to hold meetings in the future with the other impacted communities, according to Laer. The structure and feedback from this week’s “sharing session” will help the agency figure out how to conduct future sessions, she added. The session will consist of agenda items that were submitted by stakeholders and will include a discussion about the ongoing legal battle between the agency and Exide, which is fighting to remain open despite calls for its shut down. Wells Fargo is accepting applications for $11.4 million in grants to help nonprofits in 25 cities accelerate economic recovery and improvements in neighborhoods hard hit by foreclosures, including Los Angeles, the company has announced. The deadline to apply to the UrbanLIFTSM Community Grant Program is Sept. 30. The UrbanLIFT(SM) community grant program, funded by Wells Fargo and administered by NeighborWorks America(R), is designed to provide for four types of large improvement projects: single-family housing rehabilitation, demolition, neighborhood improvement and housing-related site improvements. The goal is to support neighborhood stabilization programs in areas with large ethnic populations that were significantly affected by the housing crisis, according to Well Fargo. Eligible cities were determined as parts of an agreement with the U.S. Department of Housing and Urban Development. In California, the targeted cities are Los Angeles, Bakersfield, Fresno, Modesto, Riverside, Sacramento, San Diego, Santa Ana, San Jose, Stockton and Vallejo. Other cities across the country include Phoenix, Arizona; Fort Lauderdale, Tampa, and West Palm Beach, FL; Austin, Houston, and San Antonio, TX; Detroit; Kansas City and St. Louis, MO; Las Vegas; New York; Memphis, TN; and Virginia Beach, VA. Approximately $458,000 is expected to be available for each of the communities, according to Wells Fargo. Local, regional and national 501(c)(3) non-profits that want to apply for the UrbanLIFT(SM) community grant program may do so at www.urbanapplication.org. For questions or to request applications, nonprofits can call (202) 733-6980 or email urbanapplication@nw.org. A Los Angeles City Council committee Monday called for a study into whether city policies have been holding back economic activity at the Los Angeles Mall and El Pueblo de Los Angeles State Historical Monument. Council members on the Arts, Parks, Health, Aging and River Committee instructed city staff to report back in 60 days on what can be done to attract businesses and spur job growth at the two city-owned properties. The Los Angeles Mall has been plagued by a “number of vacancies” and city officials face difficulty in generating “sustainable economic development” at El Pueblo, according to a motion introduced by City Councilman Jose Huizar, whose district includes both properties. The two city-owned sites are exceptions in an area that has seen 93,000 new jobs and around $15.7 billion in investment in the past 10 years, according to Sara Hernandez, a Huizar aide who spoke at the committee meeting. “Downtown is on the move,” Hernandez said, especially in the Arts District, South Park and the Old Bank District, where a high-end restaurant, Bottega Louie, has announced plans to expand by another 20,000 square feet to accommodate a test kitchen and employee training facilities. In addition to serving downtown court houses and city and county government buildings, the Los Angeles Mall is in the vicinity of several performing and cultural arts attractions such as the Dorothy Chandler Pavilion and the Music Center. O’Farrell added there is no pedestrian-friendly way of getting from the Civic Center to the El Pueblo de Los Angeles State Historical Monument. The two sites are divided by the Harbor (101) Freeway. El Pueblo General Manager Chris Espinoza suggested an eight-year legal battle stalled activity at the historic Pico House, a hotel that was commissioned by Pio Pico, the last governor of California under Mexican rule. Espinoza also said a conspicuously large central air conditioning unit – roughly the size of a “submarine” – also detracts from the desirability of the property for redevelopment projects. However, Espinoza said the city has several projects in the works, including a $22 million project to restore the historic Merced Theater, which is next to the Pico House. City officials plan to move the city’s Channel 35 cable station from the Union Bank Building in Little Tokyo into the El Pueblo theater space, which means cable operator tax revenue could be used toward the theater’s restoration, Espinoza said. Councilman Gil Cedillo, citing complaints from El Pueblo merchants, said city policies appear to be “undermining” efforts to revitalize the historic plaza. He pointed to challenges such as inadequate parking, the lack of accommodations for tour buses and the under-utilization of historic buildings. Cedillo noted city officials held a retreat at the Pico House recently and found the building lacks bathrooms. Cedillo last week lamented the lack of recognition paid to El Pueblo’s place in history, saying it is often seen as a “Mexican tourist attraction” rather than as the city’s birthplace. The plaza was the site of a pueblo, or town, settled by 11 founding families that eventually became the center of social and political activity for the growing community and that later grew into the city of Los Angeles. The area, now designated a state park, is home to the Italian American Museum of Los Angeles, the Chinese American Museum, the new Mexican-American museum LA Plaza de Cultura y Artes and the Olvera Street marketplace.